Brenden Aaronson may be the most exciting player in the whole damn Philadelphia Union organization. The Union’s youth movement has received a lot of attention over the season. Yes, Auston Trusty, Mark McKenzie and the rest of the first team youngsters earn praise. But note the Union’s USL affiliate, Bethlehem Steel FC. A recent Steel starting lineup had an average age of 20.47 years old. Even in the USL, that’s young. The Steel are committed to playing the Union’s young prospects, and what’s more, they’re winning — seven of their last 10 matches to be exact. If you look at the Steel’s starting 11 from week to week, you will find one name consistently in the center of the pitch: Brenden Aaronson. The center is an appropriate spot to find him too. 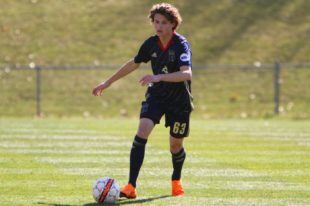 Not only is Aaronson a prototypical center attacking midfielder, but he is at the center of the Steel’s success and the center of the Union’s youth movement. A young, creative, American No. 10? He might as well be a unicorn. On appearance alone, Aaronson looks his age: 17. The kid isn’t huge, and any attempts at a playoff beard would probably result in a Sidney Crosby-esque situation. As soon as that whistle blows, however, his actions match those of a veteran. Watch any recent Bethlehem Steel match on ESPN+, and you’ll see. It’s not that Aaronson is faster or stronger than older players. He’s smarter. He sees the game in a way that either comes with a lot of time and experience playing the game or comes naturally. Sure, it’s not unusual to find a young player on the field for Bethlehem Steel, but you can spot most of them by their play. They all bring good skills and attributes to the pitch, but almost every one needs to seriously improve to bring their game to the next level, classic cases of raw talent that needs to be refined. Of course, Aaronson, who is among the youngest even on the Steel, also needs to improve, but he’s years ahead of a lot of pros in the things he does well already. What are those things he does well, exactly? Aaronson is the prototypical no. 10, especially in the Union’s system. He wants the ball at his feet. He has the vision and the accuracy to make the key pass in the final third. He has the skill to beat a man himself, and he has the ability to take the shot and score personally. Defensively, Aaronson presses as well as anyone on the Steel in transition and stays aggressive. These are skills that some of the best 10s in MLS tend to possess. What don’t they possess? An American passport. America has historically produced good goalkeepers. We’ve had our share of solid center backs and even attackers like Clint Dempsey, Landon Donovan and Brian McBride. But a creative, aggressive no. 10 has eluded us for some time, now. Those skills have been difficult for Americans to pick up. Aaronson, a native of Medford, N.J., stands counter to that. Now that he has signed a contract with the Union for next year, it will be interesting to see what he can do at the MLS level. Wait, he plays how many games? Bethlehem Steel are known for playing their kids. Brenden Aaronson, Michee Ngalina, Anthony Fontana all get to see the pitch. But Bethlehem are also known for changing their lineups from match to match. Steel head coach Brendan Burke virtually never plays the same 11. Aaronson, however, has started in seven of the Steel’s last nine matches. He’s subbed on in the other two. On a roster always in flux, the 17-year-old remains a constant. Bucking this trend is no accident. Aaronson isn’t just getting a shot to play because of some devotion to youth. He’s actually key to Bethlehem’s success. Burke plays Aaronson every week, not just to develop him for the first team, but to win games. Let’s clarify my previous statement. Brenden Aaronson may just be the most exciting player in the Philadelphia Union organization. But he’s not the one great hope of the franchise. What makes Aaronson so exciting is that he is not a child prodigy. He probably couldn’t curl the ball around a wall at age four. There have been no 60 Minutes specials on him. His success is the result of natural ability, endless amounts of hard work, and a Union system devoted to developing promising young talent. That system is showing dividends. Add FAris Moumbagna and Ben Ofeimu to your array of teenagers. Bethlehem is trying to win into the playoffs with a field-player line-up that is 50% teenagers, and 70% not legal to drink beverage alcohol. Mbaizo and Chiluya are both underage I think. The Aaronson brothers are among the only kids, aside form Alex Soto, who left for some reason, that know where space is at al times and seek to exploit it. I love watching them play, they turn with the ball at their feet and attack- destroy the defensive shape then slot the killer ball or retain possession further afield. And he’s got a brother!!! HELL YEAH!! This kid is incredible. el Pachyderm above is so right about him finding space. He made an immediate impact when he started playing for Steel and he continues to do so. With all respect to Fontana and Najem, this is the kid Union fans should be watching out for.